Late night hosts like Jimmy Kimmel and Stephen Colbert went after President Donald Trump for his comments made during Monday's summit with Russian President Vladimir Putin in Helsinki, Finland. "Helsinki has frozen over," Kimmel said while opening his ABC show. "The President of the United States today publicly sided with Russia over our own FBI on the subject of cyberattacks on our election campaign." On Monday, Trump rebuked the US intelligence community by declining to endorse the government's assessment that Russia interfered in the 2016 president election. The comments received strong criticism across the media world and even by some Republican members of Congress. Kimmel said Trump met with his "KGBFF, Vladimir Putin." "Is it possible Vladimir Putin brought a hypnotist to that meeting instead of a translator?" Kimmel asked. "We haven't seen an American so owned by a Russian since 'Rocky IV.'" Over on CBS' "The Late Show," host Stephen Colbert said that the day had shaken him to his core and that at 54 years old he doesn't have much core left. He then showed clips of reporters criticizing Trump's comments. 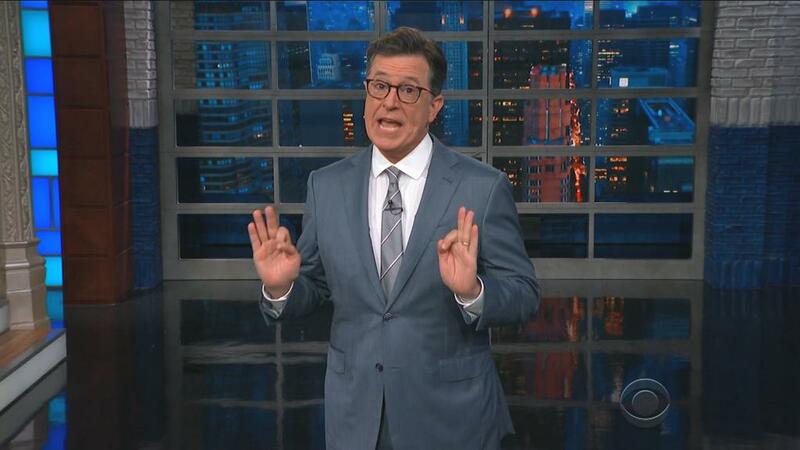 "Those are the worst reviews I've seen since Titanic," Colbert said. "And I don't mean the movie." For his "A Closer Look" segment, NBC's Seth Meyers broke down Trump's news conference with Putin, saying the president delivered "one of the most surreal performances by a president in modern American history" and "twisted himself in knots to take Putin's side." "Seriously, Trump gushes over Putin like a flustered 12-year-old who just met Mickey at Disneyland," the "Late Night" host said. On Comedy Central's "The Daily Show," host Trevor Noah opened his show by saying "if your name is Vladimir Putin then today was a very good day." The host also mocked Trump for blaming both the United States and Russia for the break down in the relationship between the two countries. "Now in Trump's defense, he has a good point," Noah said. "Sure, on the one hand, Russia messed with the US by meddling in the elections, but on the other hand, America held elections, so they were asking for it. Yeah. Makes sense."